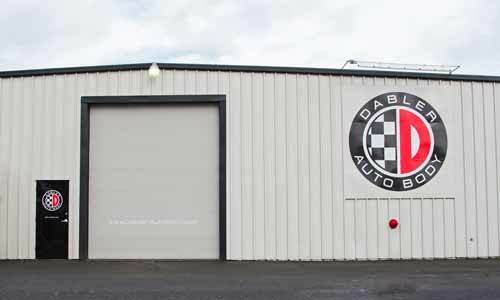 When Mike Brockway and Dennis Dabler purchased Dabler Auto Body in 2015, one of their goals was to streamline operations to maximize profitability. That included purchasing CCC Repair Workflow software for their Salem, OR, business. Not only have they found it to be extremely helpful in managing the body shop, but it has also been instrumental with production, cycle time and parts invoicing. Scott Nash (left) and Sean Snyder from Dabler Auto Body going over the production schedule using CCC Repair Workflow software. Chuck Dabler opened the original body shop in the Eyerly Volkswagen dealership in Salem in 1967. A decade later, he branched out and established Chuck Dabler Auto Body. Over the years, Chuck built a stable base of clientele and a reputation for excellent service. When he retired in 2002, his son Dennis ran the family business and Brockway came on board in 2007 as the head painter for several years. Brockway briefly left to work as a technical representative for BASF, traveling up and down the coast teaching people how to use the products. During that time, he attended training classes and learned about the benefits of running a body shop using management software. “If you want to be in the top 10 percent of body shops these days, you really have to understand software and how to run a business much the same way an insurance company runs their business,” said Brockway. He approached the Dablers about coming back to the shop and he and Dennis purchased the business. They recently celebrated their two-year anniversary. Although the facility had a solid foundation, techs focused on more than just collision repair. They were also repairing and painting motorcycles, hot rods, fire trucks, ambulances and even a washer and dryer. “We talked about picking a lane and going as fast in that lane as we possibly could,” said Brockway. The shop was bringing in about $850,000 in sales in 2014; the following year, it reached $1.4 million, and in 2016, that number grew to $2 million in sales. The partners attribute that growth in part to having a specific focus as well as utilizing the CCC ONE management software. The software combines the estimating and shop management features into a single application. Brockway said this helps eliminate errors and rekeying of information. In addition to producing cycle time and profit reports, it defines roles and tasks and tracks production. “CCC did a great job helping us get trained,” said Brockway. “The local rep is extremely knowledgeable and did a great job helping us implement everything.” He said technical support has been amazing and there is always someone on call to answer questions. His advice to shops considering a management software is to be patient during the implementation and allocate time to become proficient. This entry was tagged ASE Certified, auto, automotive, body, Business, CCC Software, frame, I-Car, I-CAR Gold Class, lifetime warranty, oregon, paint-less dent removal, repair, Salem. Bookmark the permalink.